Beautiful photography, beautifully presented That's what you and your clients deserve. 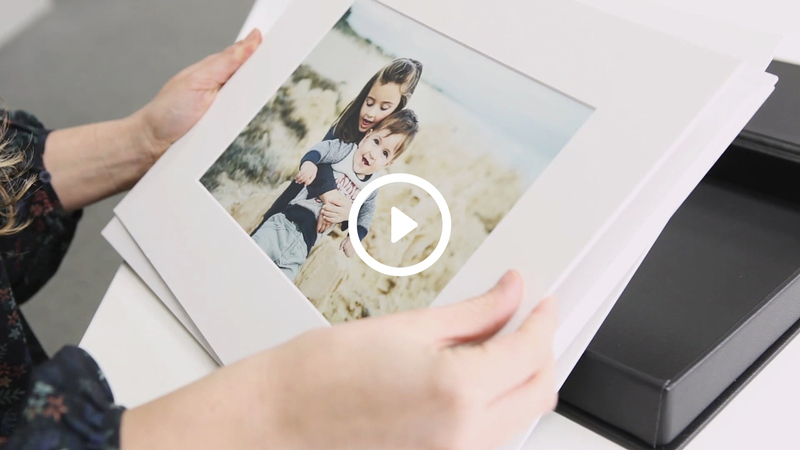 If you're into portrait, boudoir or pet photography our Studio Boxes are a must-have. Sizes: We have two sizes available: 10x8 and 14x11. You'll be able to select mat apertures to suit the images you want to display on the mats (you can mix and match throughout a box, or select one size for all of the mats). Cover materials: Available in all of our Linen, Buckram and Micro Leather materials, or choose a striking Designable Canvas cover. Printing: Choose either off-set printed Tintoretto or Traditional Photographic Paper (Silver Halide). Depth: We have four depths available to suit 10, 15, 20 or 25 mats. Extras: Boxes can be personalised with a ribbon closure, your clients' names or your studio logo (or both) and a USB Flashdrive insert (flashdrive not included). Assembly: You can order Studio Boxes printed and fully assembled by us ready for your clients. Otherwise, order the boxes empty and assemble them with prints in your studio (perfect for reveal walls and in-person sales). You can order slip-in mats for your empty boxes in packs of 20 (to minimise shipping costs we suggest ordering boxes and mats together). f you order empty Studio Boxes in bulk the price reduces. Studio logo embossing is free on orders of ten or more. Stunning handmade print boxes in a range of lovely colours.